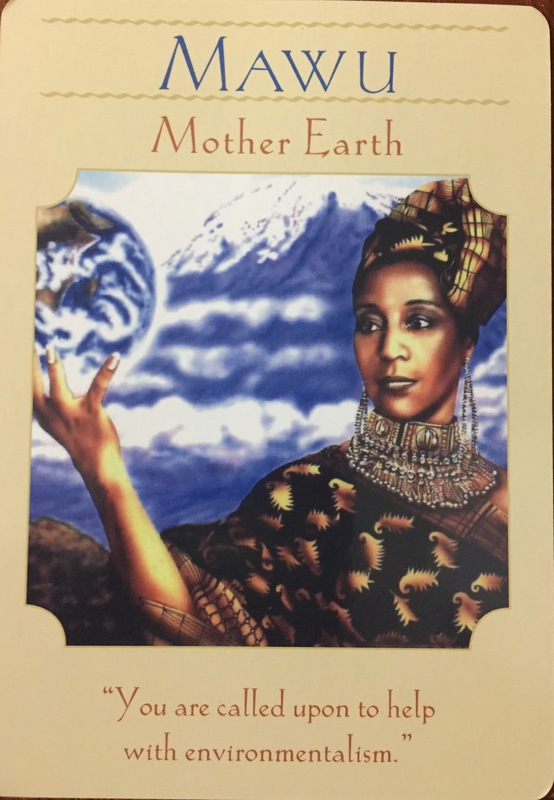 Mawu is an African moon goddess who is said to have created all life with her husband Liza, the sun god. When you are feeling out of balance, pulled in all directions, running in the rat race, it is important to stop and reconnect with our Mother Earth. A few minutes spent in nature can release the stress you are holding and help you remember who you really are. We are earth beings, as such it is important that we care for Mother Earth. She needs our protection and nourishment so that she in turn can protect and nourish us. The soil that we need to grow, the water we need to survive, and the air we breath are vital areas of Mawu that we must care for and protect. No act is too small in caring for her. We all can take steps that when added together will make a huge impact. The earth is our mother and we must take care of her. You derive your life force in part from Mother Earth. Honor and nurture this connection.